Philip Parker has always been passionate about history. A former diplomat and publisher, his first book The Empire Stops Here took him on an epic journey around the frontier provinces of the Roman empire, visiting sites from Hadrian’s Wall to the desert outpost at Lambaesis in Algeria. His critically acclaimed new book, The Northmen’s Fury, is a lively and penetrating reassessment of a people who terrorized Europe for three centuries, but brought with them a rich and misunderstood culture. His latest book A History of Britain in Maps looks at the wealth of mapping material from British history, from the 1st to the 21st century and uses them as a starting point to tell some of the more remarkable and unusual tales from the nations’ history. Philip Parker was born in Liverpool in 1965. He studied history at Trinity Hall, Cambridge and International Relations at the Johns Hopkins School of Advanced International Studies, Bologna, Italy before working in the British Diplomatic Service. He has a particular interest in ancient and medieval political and military systems. He is the author of A History of Britain in Maps (2016), The Northmen’s Fury: A History of the Viking World (2014), The Empire Stops Here: A Journey Around the Frontiers of the Roman World (2009) and the DK Eyewitness Companion Guide to World History (2010). He was the General Editor of Anova’s Great Trade Routes (2010) , winner of a Certificate of Merit for the Mountbatten Maritime Award in the Martime Media Awards 2013. 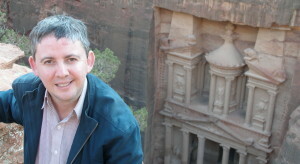 He has contributed chapters to a wide range of illustrated history titles, including to DK’s Battle (2006), Explorers (2010), History of Britain and Ireland (2011) and History Year by Year (2012). As a publisher he ran the Times books list, including works on Ancient Civilizations and The Times History of the World. He provides historical and editorial consultancy services to a wide range of publishers. He has travelled widely in Europe, North and South America, North Africa, Asia and Australia. He lives in London with his partner and daughter. Philip Parker can be contacted via his agent Rogers, Coleridge and White on info@rcwlitagency.com.